Tringa turned 2 last month. 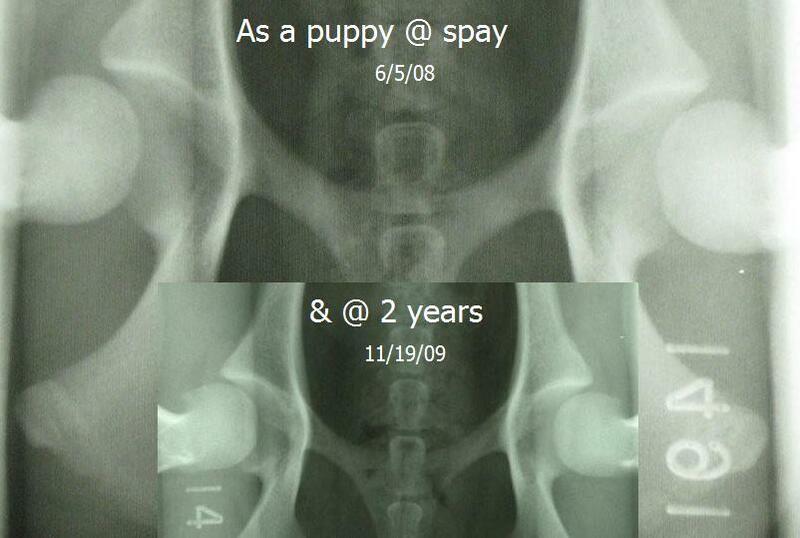 Traditionally, 2 years old would mark the milestone at which dog owners would have their dogs’ hips x-rayed to be evaluated by Orthopedic Foundation for Animals. Most people doing this would be those interesting in breeding their dog. Many breeders ask their puppy owners to do this even if they’re not planning on breeding to give the breeder valuable info about their breeding program. 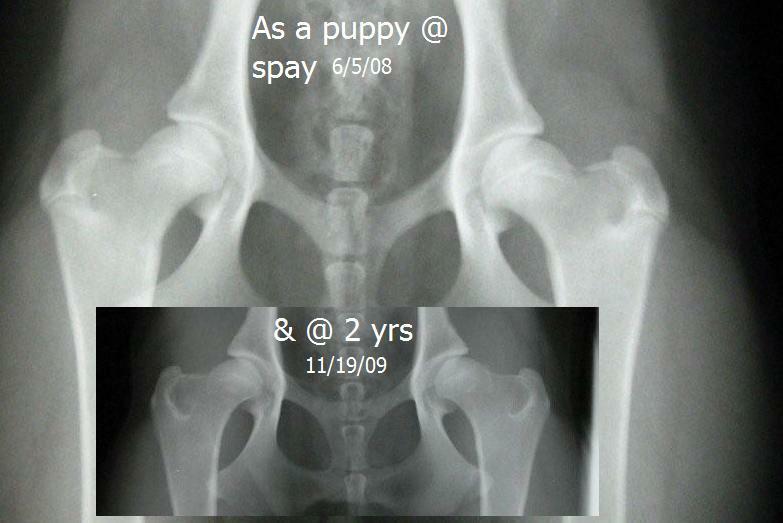 Many breeders use OFA as a determining point for guaranteeing hip health (the presence of dysplasia or not). 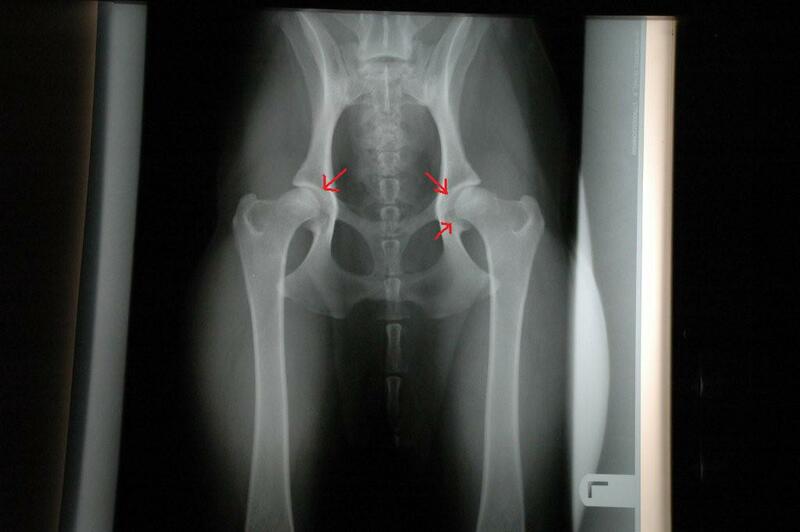 Hip dysplasia simply means malformed hips. Being dysplastic in itself isn’t always a problem. Some dogs are dysplastic and never have any problems well into their advanced age. Others can go on to develop degenerative joint disease and arthritis at a very early age. In our house, we choose to PennHip. See The Value of PennHip for a greater explanation of what it is and why we chose to do this. PennHip can be done very early. 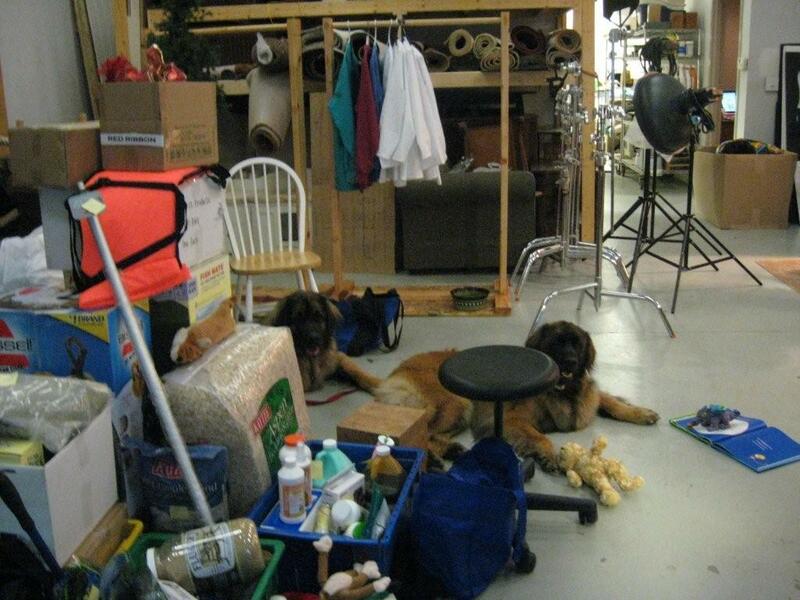 We have our dogs PennHipped when we spay or neuter them. They’re already under anesthetic so it’s easy enough to do one more procedure. There’s been discussion among breeders and dog fanciers that PennHip can’t accurately predict what dog’s hips will become. Puppies in general have a lot of laxity in their joints. It’s what keeps them safe from injuries while they’re trying to get themselves coordinated and developed. Therefore we expect them to have some distraction in this technique. I would anticipate their hips to “tighten up” somewhat as they mature. To what degree is the question we wanted answered. For our own information and curiosity, we chose to reshoot Tringa’s PennHip when she turned 2. In Tringa’s case, there was a degree of “tightening up”-but not much. Her first PennHip was shot when she was 7 months old. Her left hip had a DI of 0.82. 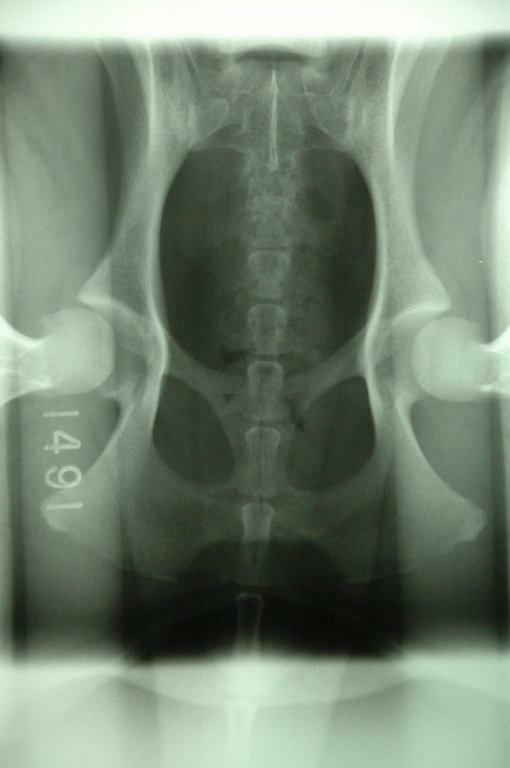 Her right hip had a DI of 0.85. Results on both hips state “DI is greater than 0.30 with not radiographic evidence of DJD. There is an increasing risk of developing DJD as the DI increases; low risk when DI is close to 0.30, high risk when DI is close to 0.70 or above.” (see The Value of PennHip for explanation of this lingo). Because of the knowledge we gained from Tringa’s first PennHip, we were able to change her activities. No jumping, no Frisbee, no anything that would stress hip joints. Swimming, dock diving, etc are things to help her stave off arthritis or joint problems. We did things to help build and stabilize her muscles. We kept (& keep) a close eye on her weight. We added supplements. We crossed our fingers and hoped the critics were right in their suspicions of the ability of PennHip to predict the future. Tringa’s second PennHip was shot 13 days after her 2nd birthday. Alas, even before the radiographs were sent into PennHip for evaluation, we could see the remodeling. In layman’s terms: PennHip DID predict the future. Even with the changes we made, in the second set of x-rays we took, we can see remodeling. Remodeling is the term used when the bone changes shape. Here are a couple of photos showing the two views taken in PennHip. Each photo has the original film compared to the second film. Can YOU pick out the remodeling? If it was too subtle for you to pick out, here are a couple more photos with the changes highlighted with arrows. What does this mean for Tringa’s future? Well, we can already see her hip problems in her gait and she’s already shifting more of her weight from her rear legs to her front legs. We’ll continue to monitor her and adjust her activities accordingly. We will take it into account when we ask her to do things and her compliance of what we ask. Is she refusing to obey or CAN she obey? When she needs it, she’ll get meds to help relieve discomfort. I also believe by doing a PennHip in her early age we gained valuable information that helped us put the need for medication off into the future.